Tony Scott's initial influence was Clarence Hutchenrider, clarinetist in the Glen Gray band. This partially explains his singular sound ("The biggest sound in the world," Perry Robinson was once heard to say). Scott studied clarinet and piano at Juilliard (he also plays guitar), and started jamming at Minton's in 1941 and on 52nd street in 1943. It was there that Ben Webster befriended him. Webster also had a huge influence on Scott's sound. Of course, he also heard Bird: "The first time was when I was sitting in with Don Byas. Bird came in and started playing "Cherokee." Now Byas could play fast, but Bird! My mouth dropped. And I was supposed to blow right after him." The converging influences of Ben Webster and Charlie Parker formed Scott's distinctive style, one quite different from Buddy DeFranco's. 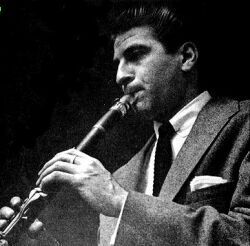 Scott sounds like no other clarinetist in history: he combines the huge tonal and phrasing gestures of Webster with the agile movements of Parker to create a hyperactive, huge but controlled surge of sound in his solos. In the early 1950's, Scott's career was in the doldrums. He said, "I decided I would never make it as a jazz clarinet player. Everybody was passing me by. No critics dug me; I was getting no publicity. Benny had had it for so long, and then Buddy seemed to have it sewed up." Later, however, he became quite popular, winning the Down Beat critics poll in 1958 and 1959, and he also became highly-regarded as a baritone saxophonist. He recorded with Milt Hinton, Clark Terry, Sahib Shihab, Henry Grimes, and Paul Motian, and he fronted a quartet with Bill Evans (just after he left Miles Davis), Jimmy Garrison (pre-Coltrane), and Pete LaRoca. It is also particularly notable that Scott was responsible for bringing together for the first time the trio of Evans, Motian and Scott LaFaro, the results of which can be heard on the Sung Heroes album (Sunnyside). Scott was well-known as a die-hard jammer, always ready to go on the stand and blow with anyone at any time. This was because of his basic philosophy. He has said, "I still prefer the jam session feeling to arrangements, and I still feel the future of jazz is with the expanding improvising soloist." When the open jazz scene he had known on 52nd Street evaporated in the mid to late 1950's, he left the United States and began to wander the globe, eventually settling in Rome in 1968. While touring in the far east he made Music for Zen Meditation, becoming the first American jazz musician to record there. (Its sequel, Music for Yoga Meditation And Other Joys, features Collin Walcott on sitar). Scott's work since then has often focused on such blends of eastern and western sounds, but he has also produced such idiosyncratic projects as a set of various versions of Billy Strayhorn's Lush Life. He still frequents the European jazz festivals, but has remained firmly rooted there and has not visited the U.S. in some years.